We’ve taken time to outline the reasons why our bulk logs for sale service is perfectly suited to the trade including pubs and restaurants with an open fire or wood burning stove. Customers love visiting a warm and cosy pub or restaurant in colder months right? It’s a unwritten expectation to have a roaring fire in the background. So why waste unnecessary time ordering logs time and time again when you know you need a regular supply. We also understand payment can be a nightmare too. E.g writing and leaving a cheque for the supplier or handing cash. Also having to pay out out all of a sudden on a bulk log delivery isn’t cheap. So that’s where we can help. You already know you will need to search for Bulk Logs for Sale during colder months, so we’ve perfect solution. Select the volume of bulk logs you need and when. Sit back, relax and we will then take care of the regular deliveries on your behalf. Simples…! You or staff will never have to search for bulk logs for sale again. We’re on Fire right? The beauty of this approach is you can spread the cost of the load across the year. So no more large financial outlay as soon as the weather decides to turn cold. It’s also much better for your cashflow simply having a small regular payment being made throughout the year. There is also no contract and you can leave and get your money back at any time -terms and conditions apply. We will also always contact you 2 weeks before any delivery is due to ensure you are ready for your delivery of bulk logs. How much does this cost? Pricing is from as little as £16 per month. We’ve a range of bulk options available. Including individually wrapped bags of logs (ideal for easily handling between the store and fire). Regular bulk logs are for sale too. Chances are if you are using a traditional supplier your logs will be tipped from a tipper truck, resulting in wasted time for you and staff having to move logs to a store area. 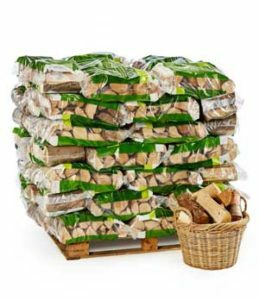 All bulk kiln dried logs on sale are delivered bagged on a pallet that can be neatly placed. Our Kiln Dried Logs also burn slowly, that will save your team time loading up the Fire.